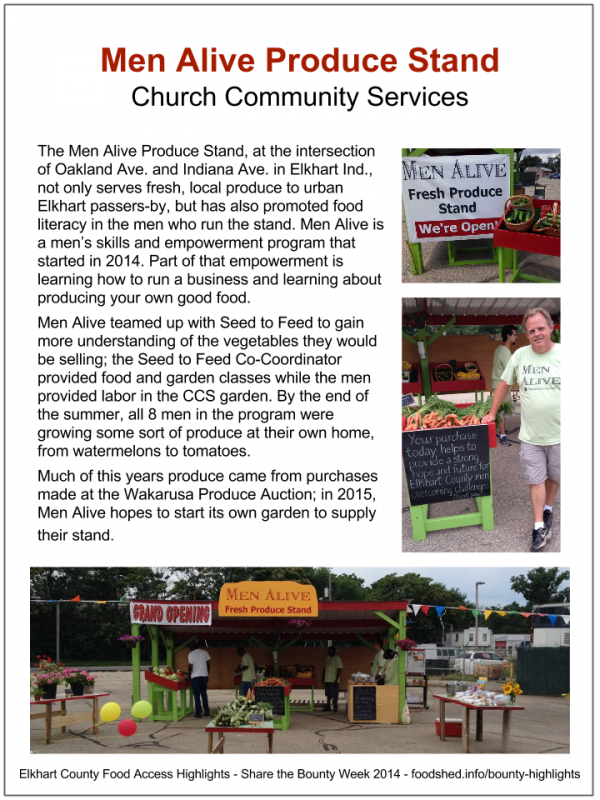 The Men Alive Produce Stand, at the intersection of Oakland Ave. and Indiana Ave. in Elkhart Ind., not only serves fresh, local produce to urban Elkhart passers-by, but has also promoted food literacy in the men who run the stand. Men Alive is a men’s skills and empowerment program that started in 2014. Part of that empowerment is learning how to run a business and learning about producing your own good food. Men Alive teamed up with Seed to Feed to gain more understanding of the vegetables they would be selling; the Seed to Feed Co-Coordinator provided food and garden classes while the men provided labor in the CCS garden. By the end of the summer, all 8 men in the program were growing some sort of produce at their own home, from watermelons to tomatoes. Much of this years produce came from purchases made at the Wakarusa Produce Auction; in 2015, Men Alive hopes to start its own garden to supply their stand.